For years, I've managed to avoid making cookies for Chinese New Year, despite gentle hints from Mom. My excuse would invariably be 'no time-lah, wouldn't it be easier to buy?'. It takes me ages to make cookies using our little oven. However given that the outlook for 2012 is not as bright, I decided to make some cookies this year - more economical. Or so I thought. Have you seen the price of butter recently? Which got me thinking about what store-bought cookies are made with. Butter? At those prices? Unlikely. PeachesandDonuts. 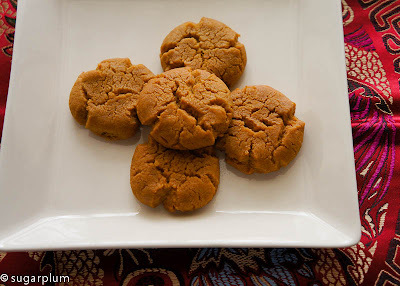 Peanut cookies are a staple during CNY, but they are normally made with lard. Ugh. Much as I love my pork, the thought of using lard isn't my cup of tea. Plus lard has a tendency to turn rancid in our humid weather. Double ugh. soft and chewy inside. It also cracked quite prettily, which gives it an even more home-made look. However, flourless also means this recipe doesn't yield very many cookies - I managed about 40 in total. Absolutely yummy and the kitchen smelled heavenly of peanuts. Method :1. Preheat oven to 175 degrees C. Grease cookie sheets. 2. In a medium bowl, stir peanut butter and sugar together until smooth. inches apart onto the prepared cookie sheets. ( I pressed the balls to get a flatter shape). 4. Bake for 8-10 minutes in the preheated oven. 5. 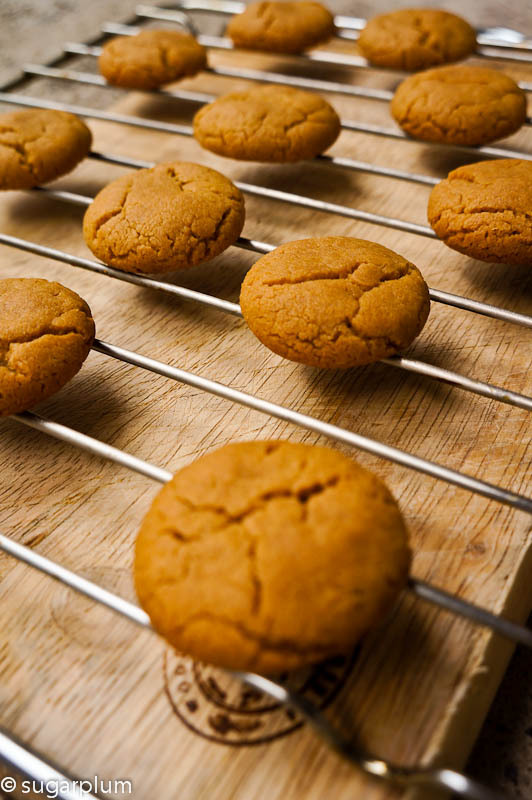 Allow cookies to cool on baking sheet for 5 minutes before removing to a wire rack to cool completely before storing. The cookies don't spread very much, so I rolled the balls and flattened them slightly, hence the cracks. ball up with a soft dough. I used smooth peanut butter, about 3/4 of a jar.